This week’s pose is Salamba Sirsasana. Salamba = with support (that is, using the arms), Sirs = head, Asana= pose/posture. We call it Headstand and some call it Head Balance. 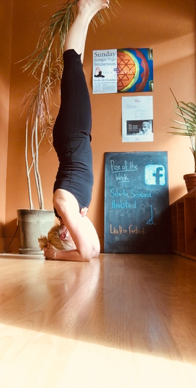 Following on from the week before last we were looking at Part 1 and 2 of Shoulderstand (Salamba Sarvangasana), where Shoulderstand is the mother or queen of the asanas and Sirsasana is the father or the king of the asanas. It’s all about your head. When you are born it’s head first into this world. Our head holds our brain – the ‘seat of intelligence, knowledge, discrimination, wisdom and power' (BKS Iyengar Light on Yoga, p.151). Our head contains our thoughts. They are constantly in motion. And yoga is the process of stilling these movements and fluctuations of mind that disturb our consciousness. This is the second sutra of the Yoga Sutras of Patanjali. Everything in yoga is concerned with this. In Iyengar Yoga this meditation on the mind begins with the body. We move from the outside, the outer sheath or layer and go in. 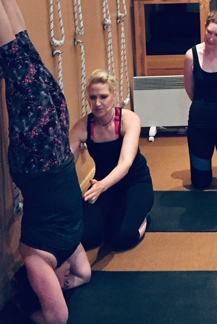 In Sirsasana we go through the process of correct alignment of the body to ensure stability and to find a degree of ease. Then we are left with just our head; inside our head, because you can’t see any part of your body (except your arms in your periphery vision). So it’s your mind you’re observing. And we hold, stay and maintain the pose. BKS Iyengar says, from 5 to 15 minutes, depending upon capacity. And lots of stuff comes up. And you inhabit the present. But it takes time, and again, it’s not an overnight thing. And it’s not an understatement to say it’s a major conquest to be balanced in the middle of the room, calm breath, quiet mind for 10+ minutes. It is the culmination of all your work, your dedication, your efforts. 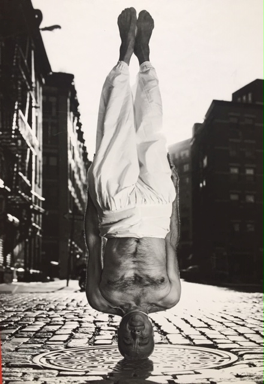 Dharma Mittra in Niralamba Sirsasana (unsupported headstand) New York City 2006 (Photograph: Michael O’Neill)- I love this photo!! At first it’s challenging on all levels. Your orientation is really put on its head. The instructions are confusing as your proprioception is challenged. It’s an effort to think clearly. And as BKS Iyengar says it’s due to the fear of a fall. “The best way to overcome fear is to face with equanimity the situation of which one is afraid. Then one gets the correct perception and one is not frightened anymore" (Light on Yoga, p. 146).